The Regina Pats Hockey Club is excited to celebrate its 100th Anniversary Season in 2017-18. Over each of the 10 months from August to May, the club will feature every decade of Pats hockey. Up next, Decade eight from 1987 to 1996. One year without a WHL team, a group of Lethbridge community people purchased the Calgary Wranglers franchise, moved the club south, and renamed it the Hurricanes. The Pup Line was formed. Mike Sillinger, Jamie Heward and Frank Kovacs formed the Pats’ legendary line. The Pats won 39 games and finished in 5th place in the Eastern division, setting up a battle with the Swift Current Broncos in the Eastern Quarter Final. The Broncos scored twice in a matter of 12 seconds to break a 4-4 tie in the third period and went on to win the first game 8-4 at the Centennial Civic Arena in Swift Current. The Pats gave the Broncos an early 3-0 lead and had to fight back only to lose game two 5-4 at the Exhibition Stadium. Craig Endean (the WHL all-time leading scorer at the time), erupted for four goals and 2 assists in a 9-7 Pats win at Swift Current. It was Endean’s first WHL playoff win in his five-year WHL career. The Pats heavily outshot the Broncos 45-25, but Sheldon Kennedy’s overtime goal sealed the Pats fate, as the Broncos took game four 4-3. The Broncos won the best of five series 3 games to 1. The New Westminster Bruins franchise was moved to Kennewick, Washington to become the Tri-City Americans. The Saskatoon Blades moved to Saskatchewan Place. Pats’ legend Dennis Sobchuk becomes the Pats head coach and on November 17 was named the teams’ GM and assistant coach Bernie Lynch took over head coaching duties. The Pats won 23 games, finishing last in the Eastern division and out of the playoffs. The Pats hired Brad Tippett on as Head Coach. The Pats finished in third place with 75 points. Troy Mick’s overtime goal helped the Pats beat the Swift Current Broncos 4-3 in game one of the Eastern Division Quarterfinal. The game was played at the Exhibition Stadium as the Regina Horse Show took over the Agridome. The Swift Current club rebounded in game two thrashing the Pats 7-2 before a sell-out crowd in Swift Current. Game three saw the Pats score four goals in the final five minutes as the Pats pelted the Bronco netminder with 56 shots as the Pats won the contest 7-3. Mike Sillinger led the way with a four-goal performance. Frank Kovacs was the hero in game four as he scored the game winner with less than five minutes left in the third period to give the Pats the 4-3 win. Pats win the best of five series 3 games to 1. The Pats victory set up an Eastern Division semifinal against the Prince Albert Raiders. Mike Sillinger’s two goals, including the winner helped the Pats win game one 5-3 at the Communiplex. Mike Sillinger was again the hero in game two as he scored twice and added two helpers in the Pats 7-3 victory. The Pats gave up four unanswered goals in a 4-2 game three loss. In game four the Pats had two 2-goal leads and blew it as the Raiders won 6-5 in overtime. The Raiders won their third straight as they picked up a 6-4 win in game five. Frank Kovacs scored twice in less than 30 seconds to force overtime in game six and Troy Mick scored the winner with less than 2 minutes left in the first overtime giving the Pats the 4-3 win and tying the series at 3. The Raiders powerplay struck for 3 goals and held the Pats powerplay in check as the Raiders finished off the series with a 6-2 win. Raiders win the best of seven series 4 games to 3. The Pats won 37 games and finished in third with 77 points. The Pats played the Raiders in the Eastern quarterfinal. Two goals in a span of 16 seconds gave the Pats a 4-3 victory in game one before a stunned crowd at the Communiplex in Prince Albert. Jeff Shantz got the deciding goal. Frank Kovacs sniped in overtime as the Pats took game two by a 4-3 score, it was Kovacs’ second of the contest. Kovacs had four overtime goals in the regular season. Mike Sillinger recorded six points (3G/3A) as the Pats swept the Raiders from the playoffs with a 6-2 win at the Agridome. 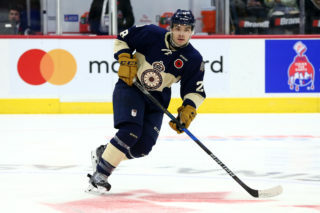 Kovacs chipped in with two goals and three assists. Pats win the best of five series 3 games to 0. Up next in the Eastern semifinal were the Medicine Hat Tigers. The Pats had a 4-1 lead at one time in the game, but the Tigers stormed back to win game one 5-4. Mike Sillinger and Louis Dumont scored for the Pats but the Tigers cruised to a 7-2 win in game two. In game three the Pats did everything but score on Tigers goalie Chris Osgood who recorded the shutout. The Pats did their best to stave off elimination rallying with a 7-2 win as Frank Kovacs scored two in the Pats game four victory. The Tigers proved too strong for the Pats as they folded up in game five as Jason Miller scored 4 times as the Tigers destroyed the Pats 8-3. Tigers win the best of seven series 4 games to 1. The Tacoma Rockets became the newest entry into the WHL. The Brodsky family purchased the Victoria Cougars. The Pats won 31 games and finished 7th in the Eastern division. The Pats Most Valuable Player and Leading Scorer was Pats all-time games played leader Frank Kovacs. The Pats failed to make the playoffs. The Red Deer Rebels were the newest entry in the WHL and played in the Western Division. The Pats were celebrating their 75th Anniversary. The Pats finished one game under 500 at 35-36-1 and in 4th place in the Eastern Division. 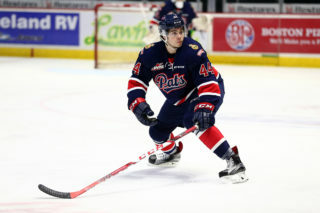 The Pats hosted the Lethbridge Hurricanes in the Eastern quarterfinal. Ivan Vologjaninov’s overtime goal at 2:08 gave the Hurricanes a 4-3 victory over the Pats at the Agridome before a small crowd of 2,704 fans in game one. The Pats edged the Hurricanes in game two 5-4 with only 2,545 people at the Agridome. The Pats held multiple goal leads in both of the first two games only to have the Hurricanes tie the contests. The Pats were down 6-4 in game three but rallied to win the game 7-6. Pats’ rookie Jeff Friesen led the attack with 2 goals and 4 assists. The Pats capped off the series win with a 2-1 double overtime win on a goal by Trevor Hanas. Karry Biette sent the game into the overtime with a goal 6 seconds left in the third. Pats win the best of five series 3 games to 1. The Pats played the Blades in the Eastern semifinal. The Pats were forced to play their first two games at Saskatoon due to an Amway convention being held in Regina. The Pats trailed game one 4-3 only to bounce the Blades 6-3. Louis Dumont scored to tie the game and Russ Gronick scored the game winner. The Pats almost rallied to win game two but the Blades held on to win 3-2.Grayden Reid scored the game winner for the Pats in game three as the Pats went on to a 4-1 win. Brandon Coates led the way with 2 goals. The Pats trailed game four 5-4 at the end of the second only to score four unanswered tin an 8-5 Pats win. The Pats finished off the Blades in Saskatoon as Russ Gronick scored the winner in the middle frame in a 4-3 win. Pats win the best of seven series 4 games to 1. In the Eastern final the Pats faced the powerhouse Swift Current Broncos. Swift Current scored twice while shorthanded and never looked back as the Broncos took game one 7-2. The Pats took a 2-0 lead in game two only to have the Broncos erupt for 5 unanswered goals as the Broncos won 5-2. With game three tied at two, the Broncos scored 4 goals in five minutes handing the Pats an 8-3 loss. The Pats tied game four late only to have the Broncos win in overtime 7-6 as Trent McCleary scored the winning goal. Broncos win the best of seven series 4 games to 0. Pats Assistant Coach Al Dumba took over coaching duties from Coach-Manager Bill Hicke who stayed on as manager. In the final Eastern Division standings there was only a five-point difference between the 3rd place Lethbridge Hurricanes and 7th place Pats. The Pats played the Brandon Wheat Kings in the first round of the playoffs. Brandon opened up the series with a game one 3-2 win at the Keystone Centre. Game two saw the Wheat Kings win 6-2 sending the series back to Regina. Jeff Petruic scored the game winner on a goal mouth scramble for the Pats in a 4-3 game three victory. Once the game ended there was a 15-minute brawl that saw the Wheat Kings receive 114 of the 184 penalty minutes handed out during the incident. Darren Ritchie (3G/2A) led the Wheat Kings attack in game four as the Brandon club skated to an 8-3 beat down of the Pats finishing off the series. Wheat Kings win the best of five 3 games to 1. 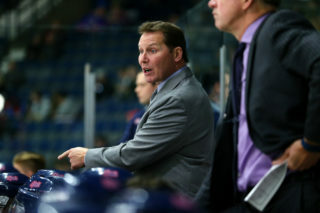 Norm Johnston was named the Pats head coach. The Victoria Cougars were sold, and the club moved from the island to Prince George. The Pats finished seventh in the nine team Eastern Division with 55 points. 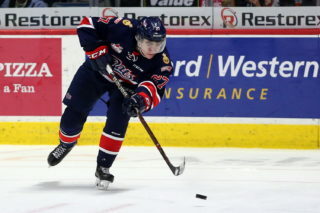 The Pats faced the Prince Albert Raiders in the first round. Game one was played in Prince Albert in front of the lowest attendance of their season (1,726) as the hometown Raiders beat the Pats 6-4. Game two had the Raiders outshoot the Pats by a 4-to-1 margin, 45-11, as the Raiders barely snuck by the pats 4-3 to take a two-game lead heading back to Regina. The Pats lost starting goalie Chad Mercier to an injury, had to rely on Tim Winters in game three in Regina. The Raiders directed 45 shots toward the Pats’ goal in a 9-6 Raider win in front of a sparse Agridome crowd of 2,381. Game four drew a paltry 1,680 at the Agridome as the Raiders completed the sweep in a 5-2 Raider win. Raiders win the best of seven series 4 games to 0. The Tacoma Rockets move to Kelowna keeping the name Rockets. Calgary gets their junior hockey franchise back. The team is known as the Hitmen as Bret “Hitman” Hart is one of the owners. The Pats are purchased by Russ Parker and the Parker family. Russ’ son Brent ran the hockey/business side of things as the General Manager and Rich Preston was named Head Coach. The WHL switched to three divisions and the Pats finished third in the Eastern division. In the Eastern semifinal the Pats played the highly favoured Prince Albert Raiders. The Pats upset the Raiders 5-4 in game one at Prince Albert. Russ Hewson scored the winner. The Pats took game two in Prince Albert as well by a 3-1 score. Chad Mercier made 31 saves in the victory. The Pats took a loss in game three by a score of 5-2 as the Raiders forwards were just too much for the Pats to handle. In game four the Pats rallied to win 5-3 as Curtis Tipler led the charge with 2 goals. In game five Pats’ goaltender Chad Mercier was having a strong game was ran over by Raiders Garnet Jacobson. Mercier left the game with the Pats leading 2-1. The Pats lost the contest 8-5. Game six saw the Pats fall 5-0 as the Raiders tied the series up at 3. Mercier had a strong game despite the injury but was pulled in favour of Aaron Mori. The Pats bowed out to the Raiders 5-1 in game seven. The wounded Pats just didn’t have anything left as the Raiders took the series in seven. Raiders win the best of seven series 4 games to 3. The Pats won 42 games and finished 3rd in the Eastern division finishing behind the Wheat Kings and Broncos in the standings. 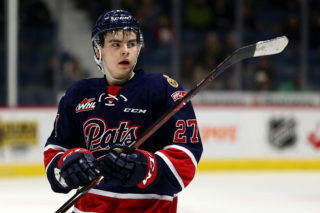 The Pats faced the Red Deer Rebels in the first round of the playoffs. Two giveaways in the first period gave the Rebels a 2-0 lead and built upon that taking a 5-2 lead early in the third period. The Pats scored twice in the third period, but the Rebels sealed the deal with an empty netter in a 6-4 game one win for the Rebels at the Centrium. Lars Pettersen tied the game in the third period, but Greg Schmidt scored early in overtime to give the hometown Rebels a 5-4 win in game two. The Rebels downed the Pats 6-2 in game three at the Agridome, taking a 3-0 series lead as they scored three unanswered goals in the third period. The hometown Pats avoided elimination taking game four 5-1, scoring four powerplay goals sending the series back to Red Deer. The Pats were just no match for the Rebels in game five as the Rebels cruised to a 5-1 win taking the series in five games. Rebels win the best of seven series 4 games to 1. 1988-89: Did not qualify for the playoffs. 1991-92: Did not qualify for the playoffs.